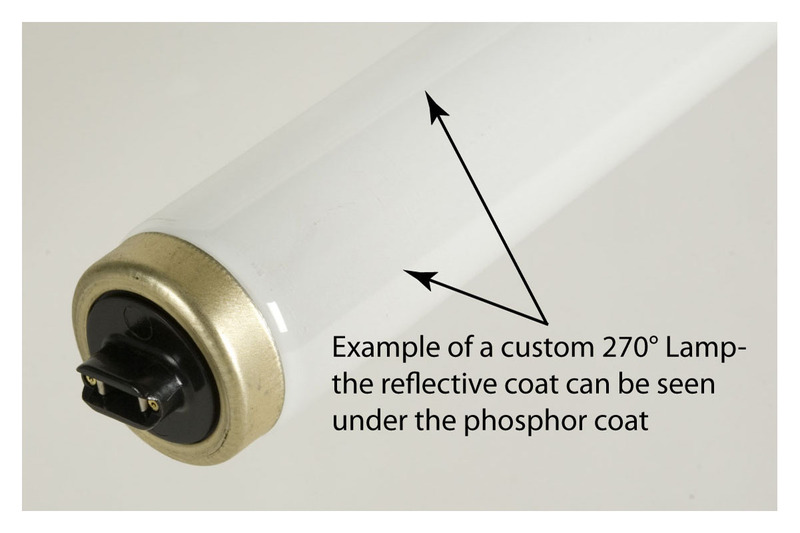 While aperture lamps are similar in construction to internal reflector fluorescent lamps, the major difference is that an aperture reflector covers a larger portion of the circumference and has a clear window in the coating for the light to come through. This 30 or 60 degree clear glass opening is called the aperture and does not contain any phosphor. It concentrates the light in one direction in order to provide a higher intensity or brightness. The reflective coating of an aperture lamp is 330 or 300 degrees and the phosphor coating covers just that area of the lamp. Since the intensity of the light increases with a decreasing aperture width, it is important to consider the size of the aperture surface. With our advanced precision technology, we can produce lamps with an aperture width as small as 2 millimeters wide. While aperture lamps are used in applications such as scanners and imaging machines, a popular new use for aperture fluorescent lamps is for edge lighting in signs and displays. Since aperture lamps are inherently uniform along the lamp’s length, the smaller diameter lamps allow edge lit signs to be built efficiently and significantly brighter as well as slenderer. They also do not create annoying light bands. At LCD Lighting we are the foremost designer and manufacturer of both standard and custom aperture and reflector lamps. Our products are made from the highest-quality material and used in applications such as scanners, copiers, facsimile machines, machine vision, sorting equipment for production lines and other imaging devices. In addition we specialize in avionic display backlighting and manufacture a wide range of specialty fluorescent lighting. Our portfolio includes cold and hot cathode fluorescent lamps CCFL / HCFL, backlight lamps and assemblies, aperture and reflector lamps, compact lamps, sub miniature lamps and HID‐MPUV lamps. The LightSources group represents the leading high-tech designers and manufacturers in the lamp industry today. Our standard lamps and components as well as customized products offer high-quality solutions to meet our partner’s unique needs. Please contact us to learn more about our broad range of standard and custom specialty lamps.